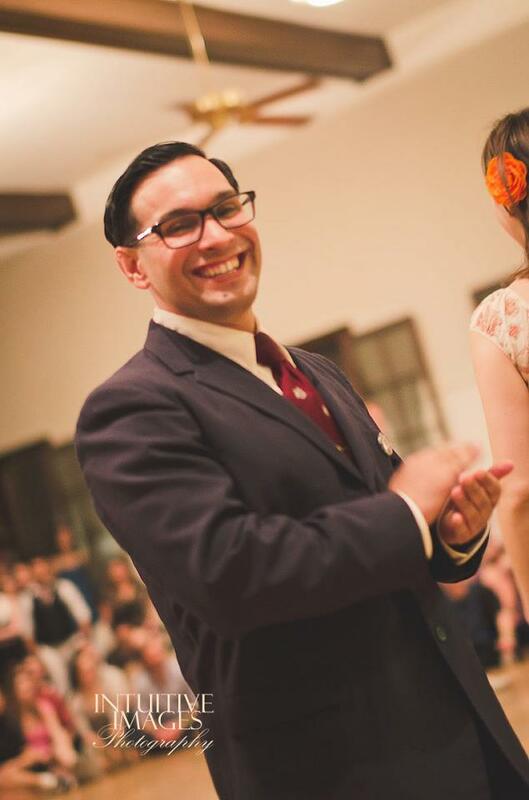 Your 2012 National Jitterbug Champion Advanced ‘Jack’ – and the smoothest guy in the room – Augie Freeman is a teacher here at Atomic Ballroom! In celebration of his Camp Hollywood win over international All-Stars Nick Williams and Juan Villafane we’re going to give you a chance to learn more about this passionate and inspiring dancer. Then catch his Lindy classes in Irvine on Tuesdays or Balboa in Placentia on Wednesdays! Can you tell me the story about when and how you came to be an obsessed swing dancer? Ha ha, it’s complicated [isn’t it always]. I guess I started in October 2003. 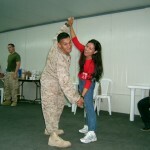 I was just back from my first tour in the military – The Invasion of Iraq – and some friends in El Paso wanted to go out and most of us do a little two step. There was this girl [there’s always a girl] I wanted to impress; she’d become a ballroom dancer through her love of swing dancing so I looked for lessons in town. Finally I found there were lessons in swing and lindy hop on base. The teacher took us on a trip to Los Angeles. And they happened to be having the last California Balboa Swing Championships at Memories in Whittier. I saw Marshall doing the splits, Minn and Corina, Steve and Heidi, Anthony and Linda, Nick and Denise and I thought …If it takes me the rest of my life, I’m going to learn that! Thankfully the dance got you! Who did you learn from in those early years? Besides the base and Rusty’s, I took classes with Shesha at Avant Garde Ballroom and private instruction with Nick Williams. I really liked what he was doing with a Hollywood style swing so took lots of privates and asked him about his dance inspirations. Well, it’s a combination of many things. I’ve always had a love of the Rat Pack, Ella Fitxzgerald, Louie Armstrong – which is rare when I didn’t grow up around music (or jazz). But I guess I really needed an outlet after Iraq. I needed the sheer joy of the music, connection with another person and a driving beat to make me feel good when I really needed it. It can be hard work having fun too… and your love for swing has taken you through many contests, learning plateaus, and frustrating practice sessions. How do you maintain that passion? Any advice for new/growing dancers facing these frustrations? You have to really love it. And you can’t think about it (the negative or frustrations). I was really inspired by listening to an interview with Frankie Manning and Norma Miller who said, “[Dancing] It’s all about the love,” and remind yourself of that when judgmental words, opinions or self-critizicm gets you down. Remember what this dance represents to you and not the negative which will pass. I love competing, but not for the sake of competition [or in pursuit of accolades] but to inspire others. I go out there and try to be creative and take care of my partner. I share my love and influences in hopes to inspire that in others; if I happen to win then it’s a bonus. Go out there and do something because you believe in it…not for what anyone else thinks. Speaking of doing something because you believe in it – Have you found a way to strike a balance between creativity and traditional fundamentals in swing and balboa? Hm…that’s something I’ve struggled with a lot over the years. Do you value pure unbridled creativity at the expense of what your partner might feel? Are polished fundamentals and good basics the only method? They both have their drawbacks and benefits, but I prefer a balanced approach to keep vintage and traditional approaches open for creativity. When I was learning from Nick, I asked him about his influences. Rather than become a copy of Nick, I sought out the clips I found mutually inspiring and learned to adapt the movements for my body. You don’t have to reinvent the wheel to be creative. If you are going to draw inspiration from outside influences [such as dances with dissimilar fundamentals], then you need to really understand the basics of swing in order to synthesize without disrupting the partner connection, flow, etc. It can look very disjointed when two basic movements don’t fit together well. But that’s the beauty of a street dance – you can do what you want. It doesn’t matter if I don’t like someone else’s creative choices. I can only stay out there and inspire others with the choices I’ve made and would like to see others value. Besides each level requiring different approaches there is also a distinction in the needs of local students verses students at national workshops. In local classes, many students come for the enjoyment of socializing or exercise and not all are interesting in training or competition for dance. My goal is for then to have fun and stay inspired to swing dance. At national workshops however, students are already inspired to spend time and money training or competing, so my goal is to help them advance, share my inspirations and influence them them as they grow. I also stress the importance of the partner dimension with all of my students. I’ve found that the ‘old timers’ valued the physical connection (stretches and compression), act of reading and reacting to another persons body rhythms and being in the moment with your partner. Check out Augie’s Blog and Drop in for one of his super classes at Atomic Ballroom!